Violinist Mikhail Simonyan has covered a lot of ground in a short amount of time. Born in Novosibirsk he traveled to the US when he was 13 to study. Since then he has traveled the world giving concerts and performing concertos with conductors such as Valery Gergiev and Kristjan Järvi and even launched a private initiative, “Beethoven Not Bullets”, to assist the newly founded Afghanistan National Institute of Music in Kabul. 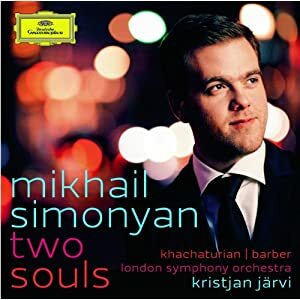 For his Deutsche Grammophon and concerto recording debut he has chosen the concertos of Khachaturian and Barber to reflect the two dominant aspects of his life. He is joined by conductor Kristjan Järvi and the London Symphony Orchestra. The album will be released on November 1, 2011 in the US.